You’ve heard me say before that it’s hard for me to actually throw anything away. So when I discovered that I could make my own, homemade vegetable stock with all of the vegetable scraps most of us throw away when we are slicing and dicing vegetables for salads and soups, I got pretty excited. I know that some of you compost, but now you can make stock and compost. Use any leftover vegetables, or vegetable scraps you have. You can use just about any vegetables you want for stock. I always save the inedible organic vegetable scraps I use like the ends of the celery bunches, or a few of the ends with the leaves (for extra flavor) tough broccoli stalks, the ends of carrots, the stems of kale and the outside leaves and the root area I cut from an onion before you slice and dice, ends of sweet peppers, etc. and store it in a gallon-sized zip-lock bag in the freezer. Vegetables I don’t find to work well are Brussels sprouts, cabbage, rutabagas, and beets. 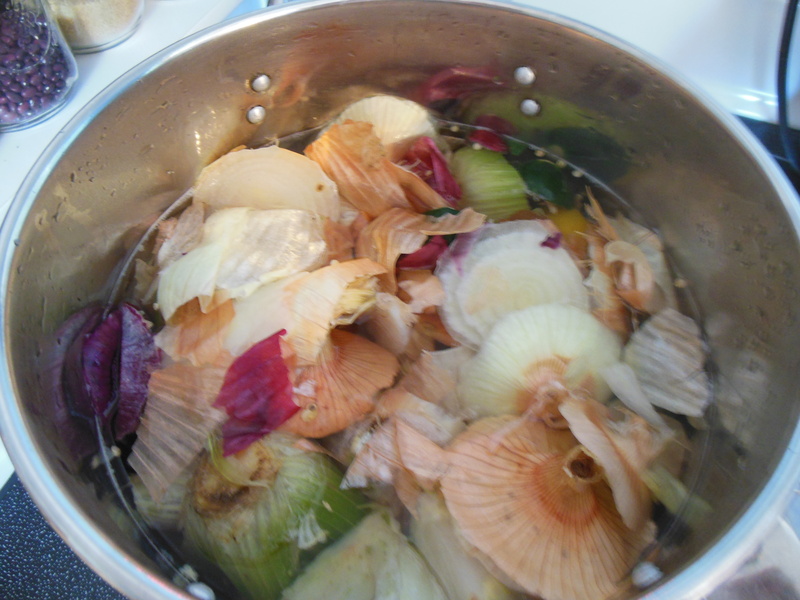 If you use the outside leaves of red onions, it can tint your stock a bit. I don’t generally mind this in my soups, but will leave them out in some batches especially if I’m fixing something for a pot luck. Then, when it’s full I toss them all together in a my big soup pot to make stock. The amount in this pic is a big full gallon size container of scraps. It made into almost 10 quarts of literally “free” vegetable stock! 1. Put vegetable scraps, onion, garlic and herbs of your choice (sage, marjoram, oregano, etc.) in a large stock pot. Add enough water to fill the pot and completely cover the vegetables. 2. Bring to a rolling boil, then turn heat down to low so that the water is gently simmering. Let simmer for at least an hour and a half. The longer you simmer, the more the flavors will come out. 3. After you are done simmering, turn off heat. Let cool and strain. I use my big stainless steel pasta strainer for this step. 4. 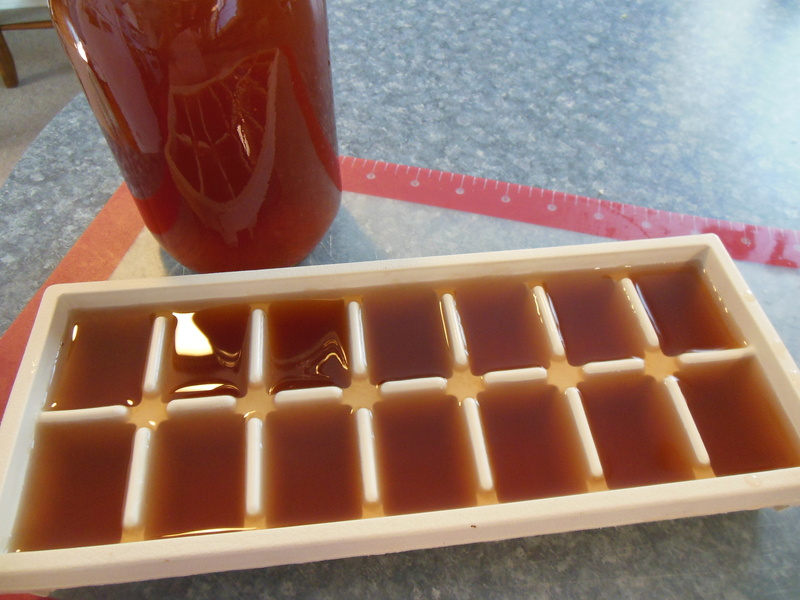 The best way to store is to pour the cooled stock into an ice trays. Then you pop them out and have them handy for those time you only need a little stock for sauteing vegetables, etc. Store larger amounts in jars (leave room for expansion) or I also pour into gallon sized zip-locks, lay them on a flat tray so the liquid freezes in a nice thin manner that is easy to store in the freezer for later use. It can also be stored in containers in the fridge.